I work only with professional tour operators and outfitters. 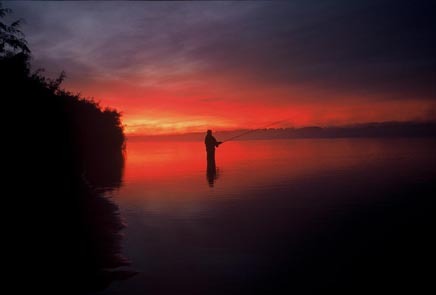 I took part in developing of big share of the fishing tours listed at this page. Yama River (Sea of Okhotsk, near Magadan) - coho salmon, chum salmon, white-spotted charr, Dolly Varden charr, yellow-mouth charr, trophy Arctic grayling. There are 2 options of this tour - a comfortable wilderness lodge or float-trip. The lodge is situated in the area with no roads (transportation by helicopter). Taui River (Sea of Okhotsk, near Magadan) - coho salmon, chum salmon, white-spotted charr, Dolly Varden charr, Arctic grayling. This is budget trip with no helicopter transportation. At the Taui River the fishermen are staying in a comfortable wilderness lodge. Tugur River flowing into the south-western part of the Sea of Okhotsk - Siberian taimen, lenok, Amur pike, Amur grayling. Transportation by helicopter, float-trip. Every year in the river taimen over 30-35 kg are landed. Uchur River (tributary to Aldan, Lena River drainage) - Siberian taimen, lenok, pike, Arctic grayling, whitefish, yellow perch. Bichi River (tributary to Lower Amur) - Siberian taimen, lenok, Amur pike, Amur grayling. Transportation by helicopter, float-trip. Bichi is one of the best taimen rivers in the world. Im River (tributary to Amgun, Lower Amur) - Siberian taimen, trophy lenok, Amur grayling. Transportation by helicopter, float-trip. Im is the best river to fish for trophy lenok (Siberian trout). Urak River (Sea of Okhotsk, near the Okhotsk village) - coho salmon, chum salmon, white-spotted charr, Dolly Varden charr, trophy Arctic grayling. The area has no roads (transportation by helicopter, float-trip). Samarga River (Sea of Japan, Primorski region) - cherry salmon, sea-run taimen, white-spotted charr, Dolly Varden charr, trophy Amur grayling. The area has no roads (transportation by helicopter from Khabarovsk, float-trip). 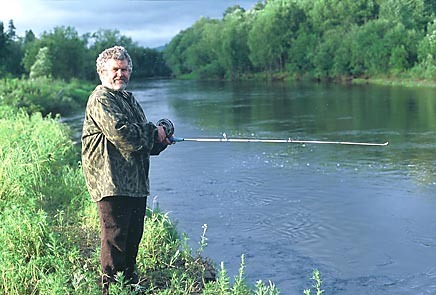 Tambovka River (south-west of Sakhalin) - cherry, pink and chum salmon, white-spotted charr, Dolly Varden charr. Transportation by car, tent-camp.